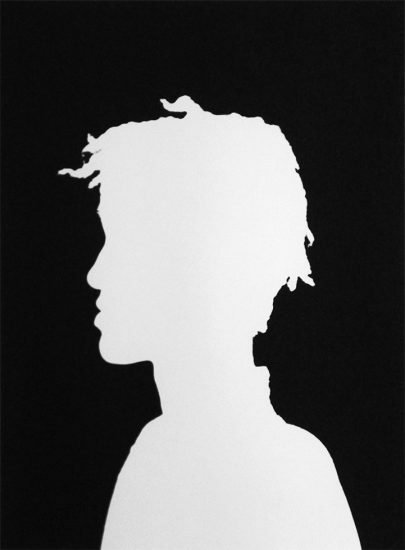 In her Untitled Heads series, Jin Lee presents head-and-shoulders profile silhouettes of young women. The identically composed images are photograms made by positioning subject in front of a piece of photographic paper in the darkroom and casting light onto her. The images harken back to seventeenth- and eighteenth-century silhouettes, many of which were made in a similar fashion using projected light and a translucent screen to define the outline of a face. Although Lee’s works are traditional in form, they also address a thoroughly contemporary set of concerns. In their typologizing approach, Lee’s images allude to historical attempts to employ photography to categorize, exoticize, or commodify individuals or groups of people. In the most sinister interpretations, her works suggest pseudoscientific attempts to use photography to connect physical characteristics to individual psychology. Clearly, Lee’s images link identity and the body. But her approach also acknowledges the complex and problematic nature of this endeavor. Her blank, white profiles deny the viewer the easy, voyeuristic access to images of female faces and bodies that is common in contemporary media. Instead of celebrating women as icons of beauty or sexuality, Lee’s heads present female identity only in its outline. In a sense, the silhouettes are a type of image that semioticians call empty signifiers. Such signifiers serve as empty screens onto which the viewer can project their own meanings. In their openness to interpretation, Lee’s images demonstrate the difficulty of negotiating the gap between the self and others.